Appropriately enough, week 7 included a 7 mile long run. Did my long run on Saturday with Jennifer, and so adjusted my schedule to take Friday as a rest day and did not do my cross-training on the bike this week. I’m past halfway, and I have more days marked off of my training schedule than are remaining. 5 weeks until the half marathon! Next weekend I am running an 8K in Salisbury, so that will be my “long run” next week (5 miles). Here’s the numbers. Ending weight – 281.8 (0.4 pound loss). I know, I loss is a loss is a loss…. but I have to be honest.. not happy. I had to share this little bit of motivation. 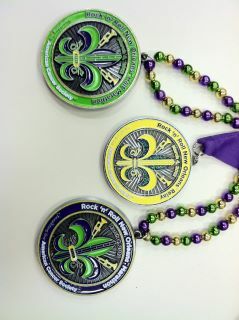 The Rock and Roll Marathon series posted pictures of the New Orleans Full/Half/Relay medals for 2012. Week 6 Half Marathon Training Recap – Halfway Point! Well, we’ve reached the halfway point in two ways. I’ve finished week 6, and I have 6 weeks left to go. Also, my long run this week of 6 miles is just under half the distance of a half marathon. (Next weeks long run of 7 will be just over half of a half). It’s hard to fathom in a month and a half I will be attempting to run my first half marathon. Also this week I registered for another race between now and the half and it will be my first race longer than a 5K. It’s the Winter Flight 8K in Salisbury NC. I was hoping for a 10K but there just wasn’t one on the schedule. 8K is 5 miles, so I’ve got a general idea from my training how long it will take, and I do know I can finish it, but it won’t be easy. Here’s a look at this weeks numbers. Total mileage – 19.5 miles. So back to losing weight which was good, hopefully that will continue. The mileage keep increasing. Next week is 4.5, 4.5, 7 so that is 16 miles total. I’m going to likely need a new pair of shoes soon and get them in time to break them in before the half. I’m pushing 150 miles on my Saucony’s and I wore them a long while before I started tracking that on DailyMile so surely they are closer to 200-250. They will still be great for wearing around the house, so I won’t throw them out, but once the cushioning starts to go and the soles start to wear I’ll have to “retire” them from running. Not a plateau, but not losing…. I’ve hit a little bit of a snag in my weight loss but it’s not a plateau per se where my weight stays the same, but rather a Groundhog’s Day scenario of gaining and losing the same couple of pounds over an over again. Here how the last month has looked since right before Christmas. Stranger in this scenario, is that 282 is the lowest weight in my log from June of 2010 before it drops off the planet until I started logging again in September of this year. Because I have always hovered around 295-310, I consider 282 to be my “Lowest Adult Weight”… so another brick wall that needs to be broken through. Even stranger is how my weight fluctuates as the week goes along. I try not to weigh 3 times a day, but it’s hard to not step on the scale when I’m in the cardio room of the Y. The week of the 3.4 pound loss started on Monday as a 5 pound loss (280.4) but then I “gained” some of that back over the course of the week before my “official” weigh in on Friday. Same happened this week. 280.6 or so on Tuesday, 281.4 on Thursday and then 282.2 tonight.. steadily gaining throughout the week. I have no idea what is going on and why this is going on. I have a problem with dehydration and I’m trying hard to drink more water, and so it’s not out of the realm of possibilities, and I’m sure some of these fluctuations are in fact water weight, but why would I be my lowest at the start of the week after a rest day? And then higher during workout days? (Drinking more water on workout days? Possible). Tough week this week, been tired and sore all week long after my 5 mile Sunday (last week’s long run) then my 4 milers from Hell on Tuesday and a tough Yoga class Wednesday. Whewww. Took my long run real easy today and ran with a friend at an easy pace. Was a good time though, kept the conversation flowing and 5.1 miles and an hour 27 minutes flew by. Also gained weight this week, but I think I’m seeing some water weight fluctuations. My big loss last week was almost even bigger, since early week was looking at a 5 pound loss but I “gained” some back over the week, so obviously water weight. Not surprised I gained a little of it back, but still down versus two weeks ago. Probably lose again next week and start going back and forth. Here’s the tale of the tape. OK, so I made it home safe and sound so I can kinda chuckle about this now after the fact, but I had to write about my horrible experience of a run last night which I labeled as my worst run ever. It was a beautiful day yesterday, 60 degrees, sunny so I’m thinking all day, I’m gonna run outside in a tshirt and shorts, take advantage of a January outside run day. Those don’t come along often. So I had to go into town to take care of something with the cable company that they couldn’t do over the phone, got that taken care of and then decided to hit up the Chinese buffet for lunch which was probably not a good idea. Came home feeling sluggish and put off my run for a couple hours. Finally hit the greenway at 5:30 (horrible traffic) and figured I had enough light left for an hour long run. Was out in my t shirt and shorts, and after about a 1/4 mile it started getting dark and cold. I briefly considered quitting and driving over to the Y to hit this run on the treadmill, but decided I was already out there and it would take 30 minutes to get to the Y in that traffic and so I decided “Heck with it” I would just be cold. 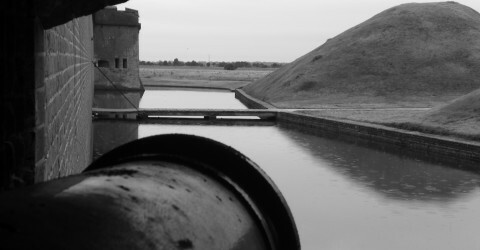 Well then it got darker and darker and colder and colder and then things were not getting any more fun. A little over a mile in and I am frozen solid and it’s only getting darker. I get to the two mile turn around point and it’s so dark I almost can’t see the path, so I’m doing a lot more walking then running at this point, and then a thought hits me that puts the fear of God in me. Most of the city parks are “7AM to Dusk” or something like that, and the parking lot for this greenway has a gate. Bad thoughts start running through my mind, what if they lock me in the gates and I am stuck here? Or worse.. what if they tow my car and I am stuck on foot? At this point I am sprinting, I don’t even feel the heavy breathing, I don’t feel any pain, I am literally running for my life. I was running like something was chasing me. I would slow down to walk and then the panic would strike again and I would be off to the races again. I don’t think I have ever had a run where my last mile was my fastest. I ran my fastest pace for the last 0.27 miles of the New Years run, but that wasn’t over the course of a whole mile. My splits for last night were Mile 1 – 13:10, Mile 2 – 14:00, Mile 3 – 12:30 and Mile 4 – 12:29. I make it back to the car and my hands are so numb I can barely work my keys in the lock, and it’s too dark to see the gate at the top of the hill so I don’t know yet if I can even get out yet or not. As soon as I get in the car and my hands start to thaw then they start to HURT bad. Ironically, it felt like that was the only part of me that was cold but they were bad cold. I get up to the hill and the gate is open, so sigh of relief but now I feel like crud and my hands are hurting. Had a hard time driving home with dead legs and hurting hands. So I get home and log my run and check my pace, of course in all irony, my fastest pace ever, dead on 13:00 minute mile, but of course I was running like the Hounds of Hell were chasing me. My friend Heather said I must run best when I am scared, so I just need something to chase me when I run. Maybe I should consider that Run for your Lives zombie 5K afterall. So there it is… Feel free to laugh now. I do feel silly the morning after. The mileage is starting to crank up now as the training moves along. I just completed today’s long run of 5 miles. 5 Miles! Holy Cow. I’m thinking about running an 8K in Feburary, and that’s how far that is, like 4.97 miles. Big weight loss this week, to make up for last weeks gain. Still up and down and all over the place but the overall trend is down. In just under 3 months since I joined MFP I’ve lost 26 pounds, so averaging a little over 2.3 pounds per week, which is what they have me set on (2 pounds a week), despite some weeks being 3.4 pounds and some weeks being 0.8 pounds, it all averages out. Tale of the tape this week. Running – (3.5, 3.5, 5.0) – 12 miles total. Ending weight – 282.2 pounds (3.4 pound loss). Not a bad week overall. Next week is supposed to be 4,4,6 but with my New Years race pushing the long runs down a week, I have next week as 4,4,5 and then week after as 4,4,6 (when the schedule has 4,4, 5K race, so I replaced that with the 6 miler). The 8K in Feb. will shift the long runs a little as well too, but I’ll worry about that in Feb.